Somewhere toward the end of this year people should see the beginning of a change in various areas of the world. What has been seen as harmful will in the end be seen as beneficial. Hunger and hate together might well begin to cease to dominate the pages of our newspapers. A quieter mood will at least begin to replace the anger and tribal ferocity of the present. Be not mistaken – this is not the end of hardship. For some there lies ahead unwelcome hardship but so it must be, for they themselves have created the situations that bring it about. However, this will not be for long. Beneficial energies of Aquarius are hastening the process of renewal and this should be seen as the keynote of the future. People everywhere are waiting for change and change they will have, whether welcome or otherwise. Have no fear for all is for the best. Reprinted below is the article by Benjamin Creme’s Master ‘The requirements of the future’. First published in Share International April 2000, it continues to be as pertinent as ever as we enter a new year. The changes needed to transform our world still remain a challenge. However, as this month’s article by the Master (above) tells us, change is indeed underway. Within a short time, men will begin to recognize that truly significant changes are taking place in human affairs. Almost without notice, far-reaching changes in how men relate to each other – communally, nationally and internationally – are already accepted as the norm. To be sure, many are the transgressions on human dignity and free will which stain and dishonour the actions of both governments and individuals, and sad it is to contemplate these cruelties. But, imperceptibly, a new spirit of tolerance and understanding is making itself felt. At the same time, less tolerance than hitherto is shown to those who flout the rule of law, who work against the Common Good and foster violence and misrule. This bodes well for the future of the race. Tolerance of evil is not Our way. Essentially, all men are One. The time is soon coming when men will realize this to be the case. When that day dawns, great indeed will be the joy which all men know. Meanwhile, a new phase in man’s history begins. Step by step, men will set in motion the requirements of the future. These must respect the destiny and free will of all. The right to the essentials of life: food, shelter, healthcare and education, must condition the direction of all governments’ actions. The safeguarding of the environment – with all that that entails – must become a sacred duty which will allow men, in time, to nurse this planet back to health. So must it be if men would inherit their birthright and find, again, the path to God. To aid men to do this, Maitreya will soon announce His presence and show His concern for all. Daunted not at all by the magnitude of the task, Maitreya will take humanity in hand and gently guide its ship into safer waters, far from the treacherous rocks on which men seem bent to founder. Maitreya will show the way back from that danger and pilot men to harbour. Thus will He ease the entry into the New Age and save men much suffering and heartache. Many there are who accept and believe that the Christ is in the world, who await impatiently His emergence into the open, yet who do no more than wait and wish, leaving the work of preparation to others. Sad it is that thus they waste the opportunity to serve uniquely at this unique time, a time like none before and none to follow. My earnest wish for these is this: that they seize this opportunity to be of service to the Christ, and to their brothers and sisters who know not yet that He is among us. Tell them what you believe: that the Great Lord is here; that Maitreya knocks loudly upon the gate. Very little time remains to do this and prepare them for this precious experience. Seize the time and act. 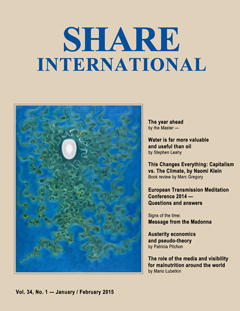 Q. November 2014 Share International magazine mentioned that Maitreya is in the Middle East. Is Maitreya still in the Middle East? Q. Is Maitreya visiting a number of countries in the region or has He remained in the same country since He first went there? A. He has visited several countries. Q. Is His presence having the desired effect – e.g. is it bringing about rapprochement, compromise, more tolerance? A. It is too early to say. Q. Is His aim in the Middle East to encourage more popular demand for human rights? A. Not necessarily. Maitreya is there to find ways to establish peace among the various religious communities. Q. Does Maitreya see His work there as successful so far? A. He sees that there is still much to do. However, Maitreya is always optimistic and patient. Q. Has Maitreya appeared on national, regional or local media since He went to the Middle East? Q. Is the Spiritual Hierarchy democratic? A. The Spiritual Hierarchy is not democratic. Difference in grade is always accepted and that difference provides another way of working. It is all to do with experience; some of the Masters are more evolved than others. Q. In the groups we have been encouraged to find new ways of approaching the public, with this information. How important is it that we do not dilute the message and that we keep strictly to the information? There is a worry in the groups because some people to make the story more accessible for people are leaving Maitreya and the Hierarchy out of it. A. If you are trying to tell the world that Maitreya is coming into the world very soon and helping humanity to change the civilization and to build a new civilization and so on and do not mention Him you are going to find it rather difficult. Nothing lifts the spirit of humanity like knowing that it is a good, fair possibility that Maitreya or a teacher at the level of the Christ is in the world and is coming out into the world and is going to work with humanity building a new civilization. It is so inspiring, so uplifting it takes people out of their misery and they are going to get in greater misery as the Sword of Cleavage does its work. It has not started. People are suffering and many people have more suffering to do. But the work is largely done and the way is clear for the Christ to come forward and that is the important thing. That is what you have to tell the people. How you say it is up to you, but do not make it too abstract, too remote from the truth. During the night of 1 November 2014 I woke up with terrible pain in the right leg. I had awful muscle cramp from my toes to my groin. I was rather shocked and worried since I’d just recently had surgery for two new hips. I was afraid that at the age of 83 I’d have to return to hospital. I wondered if something had happened to my right hip. What happened then I don’t know. I woke up, looked at the clock and saw it was 5.40am. I turned over to try to get a bit more sleep. Only some time later did what had happened in the night dawn on me. I moved my leg and discovered the pain was gone. Did Buddha Maitreya put me into a deep sleep immediately after I yelled to Him for help – so that I wouldn’t experience any more pain? Was the elderly woman someone special? On 31 March 2014 Albert and Catharina were on their way to the cremation service for Rita, a member of our Transmission Meditation group. When we got off the tram it was still a ten minutes’ walk. Albert asked a sweet elderly lady the shortest way. She asked politely if we were going to the Crematorium Westgaarde. She showed us the way, through a gate across the main road, she said this twice very softly as if she wanted to strengthen us. Once in the crematorium we handed in our flowers and went to pay our last respects to Rita – we saw that the card with Maitreya’s ‘Hand’ was underneath her hands. It was a moving service including guitar music. At the end one of us had the opportunity to thank Rita for her devotion and service, and the service concluded with the Prayer for the New Age. May we ask who the lady was who showed us the way to the crematorium? Sometime in March 2014 after attending my husband following his emergency heart operation in Rouen, at the CHU hospital, I was having problems walking because of the corns on my feet. Suddenly a middle-aged man, slightly overweight with short, cropped black hair, auburn skin, dark eyes and wearing what seemed like a blue ski-jacket with red stripes around the elbows, started attracting people’s attention to me. There was only an old lady in sight and me. He said: “Ah, social security, social security … Look at this woman (pointing to me), nobody can do anything for her, help her, but I will, I’ll help her,” or words to that effect. Too stricken by my own problems, it’s only recently that I’ve been wondering if this wasn’t a sign from one of the Masters maybe, to give me courage in my plight. M.C., Hassocks, West Sussex, UK. On 28 May 2014 as I was queuing in a coffee shop, the lady behind me said: “Thank you for holding the door open.” I was a bit taken aback to see this extremely radiantly smiling face. She seemed to be fizzing with vitality and good humour. I asked, “Why are you so happy?” She said, “You have to be happy. I’m happy all the time.” At that, my tears flowed. As she was leaving, we shook hands, embraced. As she said, “God bless you,” she literally skipped out of the café! I had been feeling very low and exhausted. Meeting this light spirit was a real tonic. Is it possible this happy person could have been one of the Masters? On Friday, 22 August 2014, just after 6 pm, I was travelling home from work on the New York City subway system. My train arrived and though it was not particularly busy for that time of day all the seats were taken except one, which was next to a large African American gentleman. Subway seats are made for average-sized people so I assumed there would not be space for me to sit. I put down my bags and stood holding onto the overhead rail. At that point the man caught my eye and gestured that he was making space for me to sit. Before I could move, somebody else took the seat and I smiled at him in thanks and shrugged my shoulders. At the next stop, however, the woman who had sat next to him left the train and I sat down. I took out my book and began to read. I became aware after a couple of minutes that he was reading over my shoulder and eventually he asked if I was a student and what was I reading. I told him “Behaving As If The God In All Life Matters”, and that I was not a student in the traditional sense but I was always studying. He started to talk about himself and told me that he was an ex-fireman. He was living in transitional housing because he’d gotten involved with a bad crowd and lost his job. Though he didn’t appear down or depressed in any way, he spoke of the unfairness of the system because the people who got him into trouble had kept their jobs and retired with a full pension while he now had nothing. All he wanted, he said, was a small apartment to call his own. We went on to talk about the disparity between people’s incomes and he said no one person needs billions of dollars and I agreed. We then spoke about how people were disconnected from the problems of others in the world – staring into space on the subway as they travelled to and from work. He said he didn’t want to be like that. I spoke to him for only 5 to 10 minutes, but I was aware that I was becoming increasingly emotional as our conversation progressed. I empathized with his situation as it seemed to me the vast majority of people ‘fall through the cracks’ of our system in some way or other and his story could have been any one of us. After I said goodbye and got off the train at my stop, it was all I could do not to burst into tears. Even now, whenever I think of our conversation I am moved to tears just by the thought of the pain most people endure trying to get through life. Can you tell me, was this man someone special? About two years ago, when Amma visited Holland I went to see her together with a friend. The program, called Devi Bhava, celebrated the feminine aspect of God, as well as God’s unconditional love and compassion for all humanity, and it lasted all throughout the night. At the end of the ceremony a number of bhajans were sung by Amma and the musicians, and, despite their fatigue, many in the crowd were dancing and singing along. Among those dancing was a man, accompanied by a woman, who was dancing most exuberantly, like a dervish, twirling around and around. If I remember correctly people were excited by his enthusiasm. The best way I could describe his appearance is by comparing him to Captain Hook, including the moustache, hat and boots. Quite some time later I was heading towards the Share Netherlands information centre in Amsterdam for a group meeting when I saw the same man sitting in the train, dressed in a similarly extraordinary outfit. This time he was accompanied by a woman, and although I sat beside them on the train, I don’t remember what they said to one another. During a short stop to switch trains I saw the man and woman walking about and noticed again how much he really stood out of the crowd, however, other people did not seem to really notice him all that much. I did not think too much of it until recently the thought of the man, and the nature of the circumstances in which I met him, popped back in to my head. Since then, I have run into this man two more times. The first time was in a second-hand store, called Emmaus, where I asked the manager for permission to put some of our group flyers on display. I found him there looking through the clothing racks together with the same woman who accompanied him on the train. They didn’t seem to pay much mind to the people around them. At the same time, the other shoppers did not seem to notice them much either. The second time I saw him was just recently, again on the train, right after Maitreya gave a blessing to the groups all over the world in December 2013. Right before getting off the train, he passed by me and my mother. As I stood behind him waiting for the train to enter the station I noticed again how peculiar his appearance was. He wore a long Woodstock-type coat embroidered with peace symbols, a hat with a foxtail attached, coloured glasses, yellow trousers and red boots. I really wanted to strike up a conversation with him this time but I didn’t get the chance to. Was this man perhaps a Master? I’m an Afrikaans speaking person, so I’ll try my best to communicate in English. I want to THANK YOU and tell you that I’m very grateful. After such a long time in my life searching for the truth, I came across this wonderful website of yours one day ago after reading A Gift... From the Stars. With tears in my eyes whilst writing to you, I can say that I instantly ‘connected’ with all of this information you are providing throughout the world. Thank you for being who you are and for fulfilling your purpose. Z.d.W., Randburg, Gauteng, South Africa. In May 1963 I did my first communion. This is a photo taken when we are in front of the church. Only recently did I realize that I may have received a special blessing that day. Can you ask your Master if this is so please? On 5 January 2015, my first day back in the office in the New Year, I noticed a handprint on the mirror of my office building’s elevator. I had been working in that building in Walnut Creek, California, for about a year, and had never seen a handprint before. It was still visible the next day when I returned to the office. Could you tell me if this handprint was manifested by Maitreya or one of the Masters? M. L., San Francisco, California, USA. This photograph was taken in August 2014 in the province of Québec, Canada, by a friend, Sylvie. She was sitting with some friends when she saw an image of the Madonna in the sky and took this picture with her phone camera. Is it possible to have this photo authenticated by Benjamin Creme’s Master? A young Dutch psychic, Robbert van den Broeke, was accorded a vision of the Madonna who materialized and gave him a message on the night of 8 January. The Madonna spoke about the need for an inclusive and empathetic response to the very recent tragic events in Paris. During the apparition Robbert was given permission to take photographs which, when viewed later, revealed the figure of the Madonna. The urgent message that the Madonna wished to convey is that while it is entirely unacceptable to cause chaos, commit murder, and carry out such extreme and disruptive acts as have just happened in Paris it is also unacceptable that the views and beliefs of all are not respected. The prophets and saints or revered figures of one group of people must be respected; the feelings of others must be taken into account. Mutual respect is of the utmost importance. God wants to approach closer to humanity in our times – which will eventually break down the ‘divide’ between various religions but the rapprochement must begin with mutual respect, a sense of our essential interconnectedness. We should start with a willingness to listen to one another, which would also help decrease fundamentalism and people’s tendency to deride and criticize other religions. We all come from the same Light. According to Robbert the Madonna also indicated that while the situation in the world may get worse for a while it will eventually lead to a great change in the way we relate to one another. It will lead to a sense of Oneness and greater understanding of our interdependence. This realization will bring about a worldwide change in our psychology. People throughout the world will feel solidarity and rise up together knowing that all are needed. We present a selection of quotations on the theme of ‘Save our planet!’from Maitreya (Messages from Maitreya the Christ), Benjamin Creme’s Master (A Master Speaks), and Benjamin Creme’s writings. What is causing this problem? What is causing global warming? If it is partly caused by the destruction of trees, then we have to stop cutting down our trees, especially the ancient primal forests of the world whose trees are great storers of carbon dioxide and pour oxygen into our atmosphere in return. Our atmosphere is becoming deoxidized and the carbon dioxide has nowhere to go, and so it creates global warming. But if we were not so profligate in our use of wood, we would cut out a great source of global warming. We do not look for the cause because we do not like causes. They are to do with laws, as in cause and effect, and we do not like it. We prefer to be beyond the discipline of the Law. The modern mechanical mind never looks for the cause because it does not want to change its technology. We may say we cannot do without wood. But what the rich countries do is preserve their own hardwood and buy what they need from poorer countries, like Brazil, countries in Africa and elsewhere. These countries are then forced to cut down, or allow to be cut down, their ancient forests, which are absolutely essential to human life. Humanity today stands poised for a great leap into the future, a future in which man’s essentially divine nature will demonstrate. Little though he may know this, man has passed and is passing the tests which will allow him, in full adulthood, to become the recipient of knowledge and powers with which to fashion that future. One of the major activities of the Space Brothers is to neutralize the pollution with which we are destroying our planet – caused in the main by nuclear radiation which is pouring out from the nuclear powerhouses all over the world. Every underground nuclear explosion also puts into the air dust which is totally contaminated by nuclear radiation with a half-life of thousands and thousands of years. Within karmic limits they mop up as much radiation and pollution as possible. They also go down into the oceans and neutralize waste which we have dumped there and which otherwise would kill off marine life and further poison the planet. Man has but little choice: the urgency of the task demands immediate action; few indeed realize the true scale of damage already done. The question may be asked: can planet Earth be saved and by what means? The answer is a resounding YES! and by means which involve the transformation of the present modes of living by the majority of men. The paramount ambition of all so-called ‘developed’ countries is to achieve an ever higher percentage of growth of their economies to become, thereby, richer; and, in an economic world based on competition, to attain dominance and power, and so enjoy a higher standard of life. This being so, the pillaging of the Earth, the cavalier waste of resources, is seen as only natural and necessary. This irresponsible action has at last brought planet Earth almost to its knees. Maitreya, you can be sure, will not be long in addressing this urgent problem and in presenting His solutions. The first step, He will advocate, is the acceptance of the urgency which many today deny. Sharing, He will say, is the beginning of the process of change which will provide the answers to our woes and the rehabilitation of Earth. Border Angels/Angeles De La Frontera is a non-governmental organization based in San Diego, California. The group seeks to stop the needless deaths of undocumented (“illegal”) immigrants who cross the US-Mexico border, mainly through the Imperial Valley desert and the mountain areas around San Diego. Enrique Morones is founder and executive director of Border Angels. He is an advocate for the rights of people on both sides of the US-Mexico border and for border activists and organizations. He is co-author of The Power of One: The Story of the Border Angels (2012). Jason Francis interviewed Enrique Morones for Share International. Naomi Klein hardly needs an introduction. Those who have read No Logo, her critical examination of globalization, or The Shock Doctrine, her incisive exposé of disaster capitalism and the havoc it has wrought throughout the world for decades will know that she is an investigative reporter of the first order. In her new book, This Changes Everything: Capitalism vs. The Climate, she delineates the reasons why the modes in which we presently live are completely incompatible with securing a habitable planet for future generations. The most important point her book makes is this: the scientific evidence is conclusive that what is called “Decade Zero” is here. It means that we have 10 years to reverse, or stabilize to the safest levels still possible, the trend of global warming. Any claims to the contrary are completely false, and we continue on as we have at our peril. Pitchon also takes the reader through an alternative to austerity economics as proposed by Weeks. In a landmark agreement between the world’s two largest emitters of greenhouse gases, the United States and China promised to limit their carbon emissions over the next two decades. Under the plan, the US agreed to cut its emissions by 26-28 per cent compared to 2005 levels by the year 2025. China pledged to reach peak carbon emissions by 2030. To reach that goal, clean energy sources such as solar and wind power would account for 20 per cent of China’s energy by that year. This marks the first time that China has committed to limiting its output of carbon dioxide. Ending years of emotionally charged debate, New York Governor Andrew Cuomo announced a statewide ban on hydraulic fracturing (commonly known as ‘fracking’), a process that injects water, sand and chemicals at high pressure to release natural gas and oil from rock formations. Citing the significant health risks associated with fracking and the insufficient scientific evidence that would ensure its safety, Cuomo said he was deferring to the qualified experts who presented these findings in a long-awaited study. In the largest climate march in the history of Latin America, more than 10,000 people from throughout the region and beyond marched through the streets of Lima, Peru on 10 December 2014 calling for urgent action on climate change. The People’s Climate March in Lima coincided with the international UN Climate Change Conference that took place in the city during the first two weeks of December 2014. Calling for ‘System Change, Not Climate Change’, marchers represented diverse groups including indigenous communities, farmers, trade unionists, students, and religious groups. Organizers said the march’s message was not only a call for action on climate change, but also for fairness, as well as protection for environmental activists, especially in Latin America, who face harassment and even death from corporate interests.